This game makes a fun, interactive gaming world an exciting place to learn because it is constantly changing. JumpStart World Kindergarten creates a dynamic world by making use of both broadband Internet and your computer's hard drive. While your child plays within the JumpStart World, the program connects to the Internet to send information about the child's progress and receives new content based on that progress. But parents needn't worry about their children's safety, because their children are never playing online. Upon entering this rich vibrant world where waterfalls flow, butterflies flutter, and virtual friends are always available, kids pick a character to represent them while they play. They use the computer's arrow keys to control their character. Then it's off on missions suggested by characters they meet inside the JumpStart World. They may need to find floating red orbs (a clever way to get you to explore the world), interview other characters to solve a mystery, or buy something from the game’s vending machine to help another character. Gems, the currency within this world, are earned by playing learning games in either the Math Arcade or the Reading Arcade. While going on missions is fun, kids can also decide to just explore the big open environment. Unlike other educational children's software, this game does not require you to follow a linear path. With so much to do, kids can decide to forgo their mission and explore a new path, bounce on jump pads that send you flying across the world, take a ride down a massive slide, swim in a lake, talk to other characters, paint pictures, acquire and then play with pets, explore educational games, and much more. The game even builds in recess from the missions to make sure children have time to simply explore. Because acquiring gems is essential to being able to fully engage in this world, kids will need to frequently play the educational games that earn them. There are over 15 games available at any time. Kids can match upper and lowercase letters in a concentration-type game, hop across moving logs to match shapes in a Frogger-type activity, and collect letters in alphabetical order as they drive through a grid. With gems, kids can buy pets, decorations for their own personal cottage, music tracks to place in jukeboxes, and presents for others. Every time kids enter this beautiful dynamic world there is always something new to find. The seasons change, holidays are celebrated, educational games change, and new areas open as more content is added. Plus this world is personalized. When parents upload the game, they can enter birth dates and relevant holidays, add favorite photos, and create personalized banner signs for airplanes to fly overhead. Even better, when children make artwork within the JumpStart World's art studio, their creations appear on billboards throughout the JumpStart World. JumpStart World Kindergarten is a masterpiece of children's technology. It cleverly mixes the exploration of a constantly changing animated world with accomplishing missions that require kids to practice essential kindergarten skills, including counting, colors and shape recognition, alphabet identification, and following directions. As kids learn to navigate this expanding World, they build confidence about trying new things. By playing, they earn badges that stress social themes like friendship, sharing, and teamwork. This product is meant to be explored over time. The boxed game or downloadable version (from www.jumpstartworld.com) costs $20 and contains the first two of 12 installments of content. That means children can explore over 30 educational games and missions and parents will receive regular email progress reports and parent tips. Thereafter, additional installments are available for $8 apiece, which build on the skills already learned. Each installment opens up new parts of the JumpStart World and contains new games and missions. 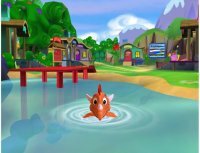 After a year of this content and over 180 math and reading lessons, kids will be ready to explore JumpStart World First Grade and thereafter JumpStart World Second Grade, games that are also currently available.